How does the CO2 analyzer work? Air is slowly pumped through a small cylindrical cell with flat windows on both ends. Infrared light is transmitted through one window, through the cell, through the second window, and is measured by a detector that is sensitive to infrared radiation. In the atmosphere carbon dioxide absorbs infrared radiation, contributing to warming of the earth surface. Also in the cell CO2 absorbs infrared light. More CO2 in the cell causes more absorption, leaving less light to hit the detector. We turn the detector signal, which is registered in volts, into a measure of the amount of CO2 in the cell through extensive and automated (always ongoing) calibration procedures. Why do we express the abundance of CO2 as a mole fraction in dry air? The concentration of a gas is defined formally as the number of molecules per cubic meter. The goal of our measurements is to quantify how much CO2 has been added to, or removed from, the atmosphere. The concentration does not give us that information because it primarily depends on the pressure and temperature, and secondarily on how much the relative abundance of each gas has been diluted by water vapor, which is extremely variable. Only the dry mole fraction reflects the addition and removal of a gas species because its mole fraction in dry air does not change when the air expands upon heating or upon ascending to higher altitude where the pressure is lower. Nor does it change when water evaporates, or condenses into droplets. Why is this so important? Here is an example: The amount of CO2 is higher in the Northern than in the Southern Hemisphere as a result of the combustion of coal, oil, and natural gas. The measurement of this difference gives us crucial quantitative information about the emissions and removals of CO2. The concentration change produced by the addition of water vapor can be greater than the CO2 difference between the two hemispheres. In contrast, the difference in dry mole fraction does reflect the differences in emissions and removals between the hemispheres. Figure 1. 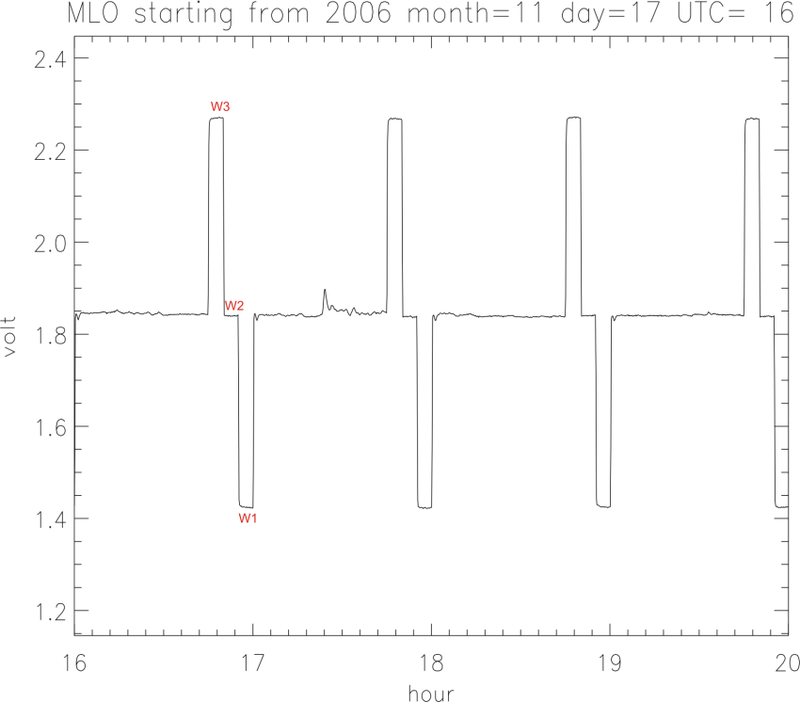 Voltage output from the Mauna Loa CO2 analyzer for November 17, 2006. The analyzer measures an hourly cycle of ambient air and three standard reference gases with known amounts of CO2. Figure 2. Voltage output from the Mauna Loa CO2 analyzer for November 17, 2006. The ‘target gas’ is being measured during hour 21. The different colors represent data that has been marked by the data selection criteria. If one of the calibration gases has a wrongly assigned value the measurement of the target gas will produce the wrong result. An example of a daily target measurement is shown in Figure 2 where, during hour 21, the analyzer alternates between the three calibration gases and the target gas. The target gas has low mole fraction in this case, registering at ~1.1 volt. The repeat cycle of every 25 hours causes the target measurement to slowly move through the diurnal cycle because every day it is measured one hour later than on the previous day. The observatory is surrounded by many miles of bare lava, without any vegetation or soil. This provides an opportunity to measure “background” air, also called “baseline” air, which we define as having a CO2 mole fraction representative of an upwind fetch of hundreds of km. Nearby emission or removal of CO2 typically produces sharp fluctuations, in space and time, in mole fraction. These fluctuations get smoothed out with time and distance through turbulent mixing and wind shear. A distinguishing characteristic of background air is that CO2 changes only very gradually because the air has been mixed for days, without any significant additions or removals of CO2. Another common word for emissions is “sources”, and for removals, “sinks”. 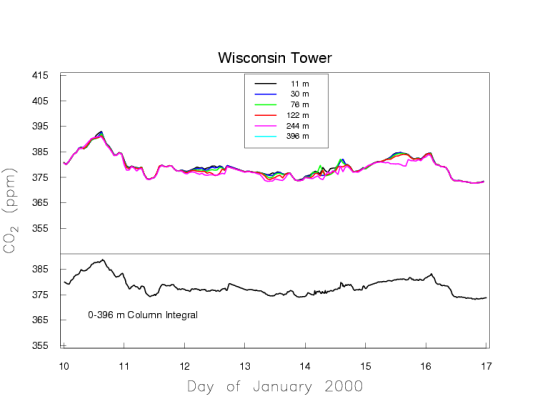 Figure 2 shows an example of the data selection procedures we use to eliminate air that has likely been influenced significantly by nearby sources/sinks. First the time axis needs to be explained. The title of Figure 2 reflects that we keep date and time at the Mauna Loa Observatory in Universal Coordinated Time, abbreviated as UTC. UTC is the same across the entire world. It succeeded Greenwich Mean Time in 1961, and is widely used and unambiguous. Local time in Hawaii lags UTC by 10 hours, so that 10 am UTC corresponds to midnight locally. 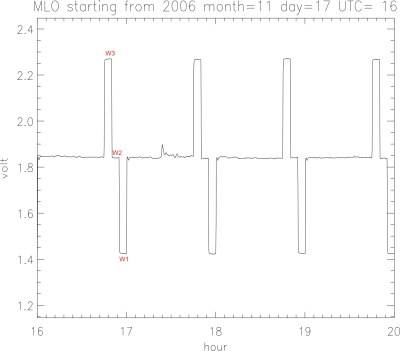 Figure 2 shows 17 November 2006 from midnight to midnight in Hawaii. In Figure 2 all hours are consecutively counted starting from 0 on 17 November 2006 UTC hour 0. Note that the last 10 hours (24-33), the afternoon and evening in Hawaii, are already part of the next day in UTC. The standard deviation of minute averages should be less than 0.30 ppm within a given hour. A standard deviation larger than 0.30 ppm is indicated by a “V” flag in the hourly data file, and by the red color in Figure 2. The hourly average should differ from the preceding hour by less than 0.25 ppm. 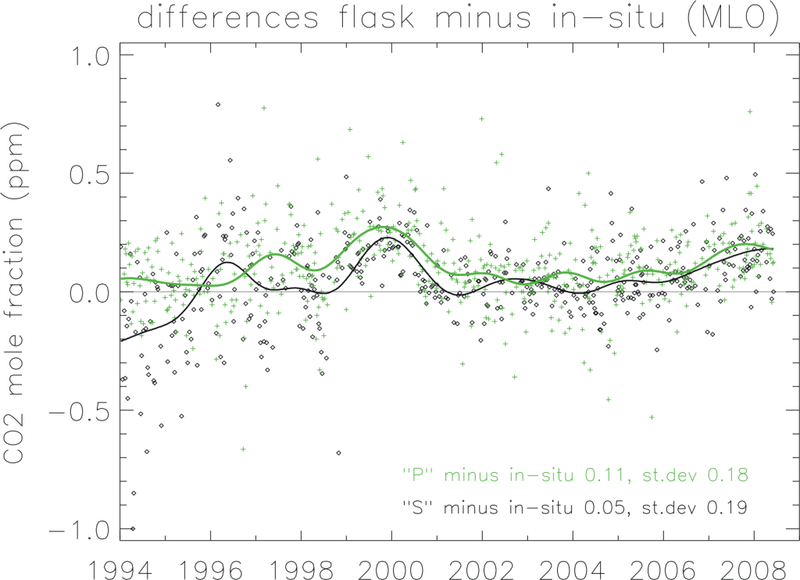 A larger hour-to-hour change is indicated by a “D” flag in the hourly data file, and by the green color in Figure 2. There is often a diurnal wind flow pattern on Mauna Loa driven by warming of the surface during the day and cooling during the night. 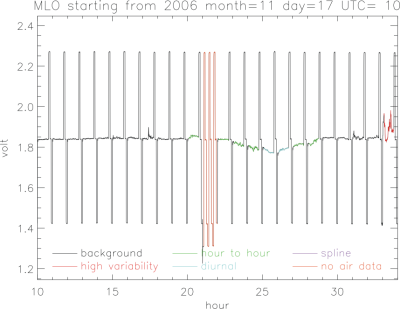 During the day warm air flows up the slope, typically reaching the observatory at 9 am local time (19 UTC) or later. The upslope air may have CO2 that has been lowered by plants removing CO2 through photosynthesis at lower elevations on the island, although the CO2 decrease arrives later than the change in wind direction, because the observatory is surrounded by miles of bare lava. In Figure 2 the downslope wind changed to upslope during hour 18. Upslope winds can persist through ~7 pm local time (5 UTC, next day, or hour 29 in Figure 2). Hours that are likely affected by local photosynthesis are indicated by a “U” flag in the hourly data file, and by the blue color in Figure 2. The selection to minimize this potential non-background bias takes place as part of step 4. 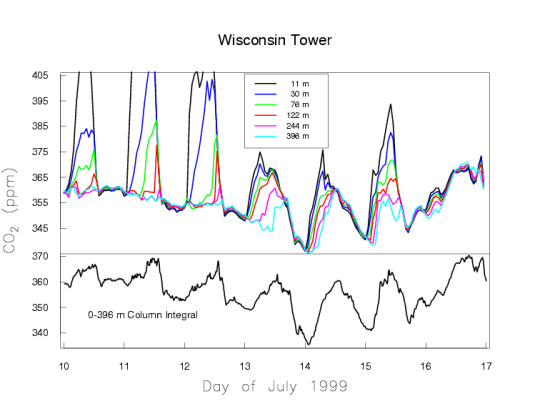 At night the flow is often downslope, bringing background air. However, that air is sometimes contaminated by CO2 emissions from the crater of Mauna Loa. As the air meanders down the slope that situation is characterized by high variability of the CO2 mole fraction. In Figure 2, downslope winds resumed in hour 28. Hour 33 in Figure 2 is the first of an episode of high variability lasting 7 hours. In keeping with the requirement that CO2 in background air should be steady, we apply a general “outlier rejection” step, in which we fit a curve to the preliminary daily means for each day calculated from the hours surviving step 1 and 2, and not including times with upslope winds. All hourly averages that are further than two standard deviations, calculated for every day, away from the fitted curve (“outliers”) are rejected. This step is iterated until no more rejections occur. These hours are indicated by an “A” flag in the hourly data file, and by the purple color in Figure 2, also indicated as “spline” in the legend. Spline is a curve fitting technique. 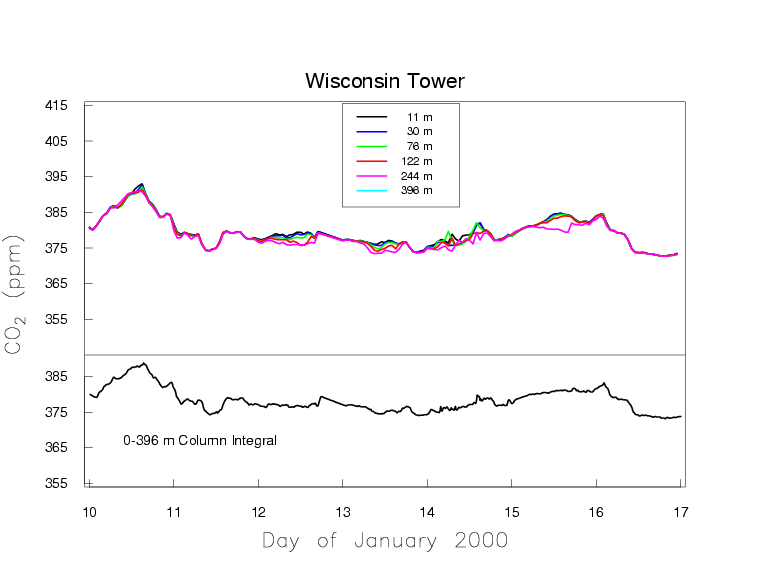 Rejected hours occurring during times with upslope winds are given a “U” character in the data file. Hours for which we do not have valid air measurement are flagged with an “I” character in the hourly data file, and by the orange color in Figure 2. The hours during which we do a target gas measurement are an example, but there are also other causes, such as zero flow in the analyzer. Figure 3. The distribution of hours with background air after data selection. No data are thrown away. Hourly means are calculated wherever possible, and how we use that data is indicated by the selection flags. Raw data are the voltages recorded for the air measurements as well as for the reference gas mixtures used for calibration and for the target gas. On average over the entire record there are 13.6 retained hours per day with background CO2 mole fractions. The distribution is wide, as shown in Figure 3. Only those days with more than one remaining background hour have been plotted. There were zero days with 24 hours of background data after we introduced the target gas strategy, reducing the maximum number of background hours per day for almost all days to 23. Before we used the target gas we used 2 sets of reference gas mixtures, called working standards and station standards, as described in the references below. 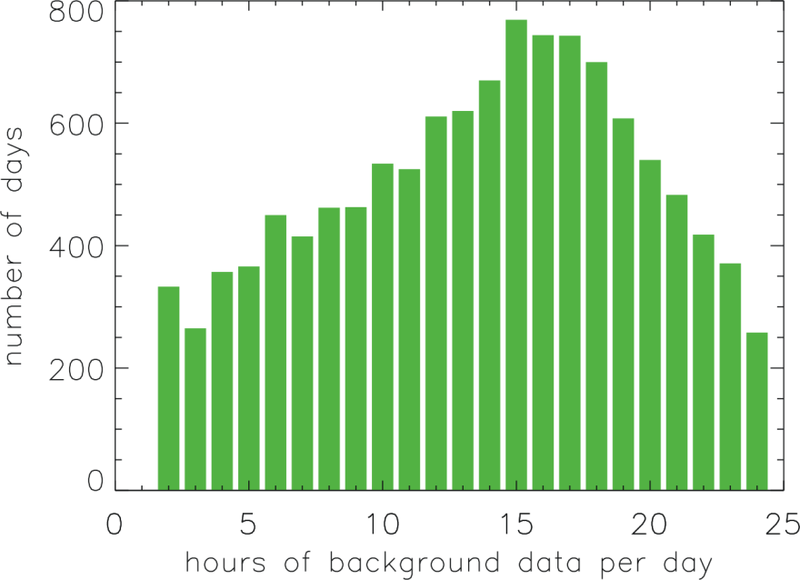 The number of days with 0 or 1 background hour comprises 6.5% of the total. Since 1995 our laboratory has been the CO2 Central Calibration Laboratory of the World Meteorological Organization (WMO). Before 1995 that role was filled by the Scripps Institution of Oceanography of the University of California in San Diego. We maintain the WMO Mole Fraction Scale for CO2-in-air. The WMO Scale is based on 15 so-called Primary Standards that are calibrated in terms of fundamental quantities at intervals of ~1.5 year by manometric measurements. They have CO2 mole fractions that span the range of ambient air. The primaries are stored in high pressure aluminum cylinders. The Primary Standards themselves are only sparingly used, so that we can build up a calibration history for each of them over several decades. 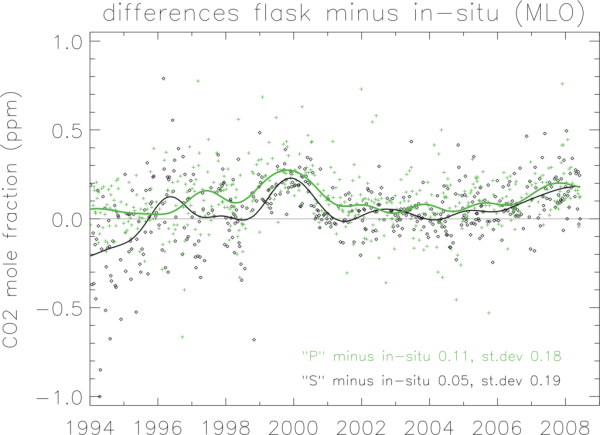 During such a calibration episode, lasting 2-3 months, each Primary is measured three times. Each time a sample of air is taken from the cylinder and its pressure and temperature inside a closed volume are measured very accurately, after temperature and pressure have stabilized in a temperature controlled environment. The volume of approximately 6 liters is accurately known. Once the pressure, temperature, and volume of a gas are known, the amount of gas can be calculated, taking the temperature dependent compressibility of the gases into account. Then the air, with the CO2 that is to be determined still in it, is slowly and completely flowed at low pressure over a cold trap cooled with liquid nitrogen. The condensate in the cold trap consists of carbon dioxide, nitrous oxide, and residual water vapor. The latter is low, corresponding to 1 ppm or so in the dry high pressure cylinder. After separation of the water vapor component, the carbon dioxide and nitrous oxide are transferred to a small volume, about 10 cc, which has also been very accurately calibrated. After stabilization, the pressure and temperature are once again recorded, and total amount of the two remaining gases calculated. At that point we have determined the combined mole fraction of carbon dioxide and nitrous oxide in the cylinder air. The latter typically comprises less than one thousandth of the total, and we correct for its contribution after measuring nitrous oxide separately on a gas chromatograph. Figure 4. The figure shows differences between grab samples of air in glass flasks, and the corresponding hourly mean CO2 value from the Mauna Loa in-situ analyzer. There are two types of flask samples, the ‘P’ type collected using an independent flask sampling package (green pluses), and the ‘S’ type, collected using the in-situ analyzer air intake lines (black diamonds).